Go to the Juxtapoz website to see their holiday greeting and have a good laugh. Here is the second installment of the SB Mission series. This shot was actually taken on the same day as Mission shot #1 but the sky was changing so drastically, in such a short amount of time, I took a few extras for posterity. I didn't want this one to go unseen... so here it is. Jesse Alexander and I made the trip down to Burbank this morning to visit Jay Leno's garage. Upon arrival, we hopped out of the car, grabbed our camera gear and headed inside the compound gate. We were greeted at a side-door to the garage by one of Jay's assistants and it was then that we saw a sign... literally. I had a feeling, when I mentioned this trip in my last post, that this would probably be the case. We are a cursed breed of artist... it seems that a lot of people fear the photographer these days. All it takes is a few bad seeds out there to give a tainted name to the rest of us. None the less, the collection of cars was most impressive and included, what seemed to be, one of everything ever made. There was enough to keep any 6 year old or full grown man occupied for hours, although I will say... Jay doesn't seem to be a big fan of Ferrari. Since I couldn't shoot, you're gonna have to just go here and see it for yourself. On a side note, the trip was not a total "photo" loss. 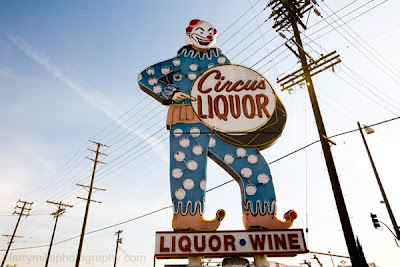 On the way there, we spotted a great neon sign at a liquor store in North Hollywood. Check it out... I'm definitely going to have to go back and hit this one up at night. My friend, Gail, and I are planning to shoot the Felix Chevrolet sign in the near future, so we'll have to work it in then. Ok, so I didn't make out to El Mirage. Sure... I may have missed out on some good photo op's, but there will be more racing next year, starting in May, and I can try to make it up then. This Thursday, on the other hand, is a once in a lifetime chance that I can't miss. My client/fellow photog/good buddy, Jesse Alexander, who has befriended Jay Leno, invited me to join him on a quest to LA and visit Leno's garage. I am excited to have the opportunity to view such a vast and prestigious collection of automobiles and... tour the shop where all of the cars are restored and maintained. Hopefully we'll see Jay as well but, let's face it, the cars are more important. 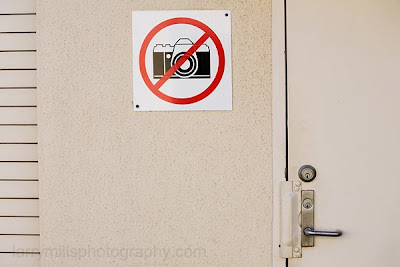 I am hoping to be able to take some photos while I am there too, I'm not quite sure what the policy is on that yet. Check back soon, my next post will be the photos... if they happen. ... I should be there right now, but I'm not... and for good reason. It was Thursday evening and all was a go for my trip to El Mirage the next morning. I went to the store with my wife and while we were in the check-out line I got a call from our friends, James and Courtney, who live only a block away from us. 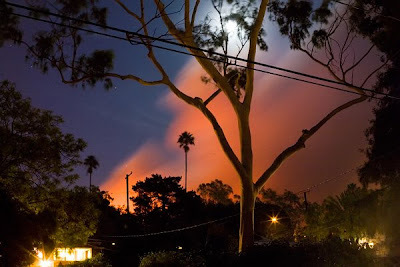 They told me about a big fire burning right behind the hill that our homes sit on (we all live on Santa Barbara's lower Riviera) and that we should get home soon. This seemed weird since we were just there twenty minutes earlier and everything was fine. We were twelve miles away in Goleta, CA and could see the fire when we got on the freeway to head back. By the time we got home, there were sirens all around and helicopters in the air. From our porch we could see a huge cloud of red smoke that was being illuminated by the flames that were just out of sight. As a precaution, we packed up all of our valuables including: computers, external drives and negatives. I was convinced that we'd be OK and went out to the porch with a tri-pod to take a couple of pics. Soon, the power went out in all of Santa Barbara (except for us up by the fire... go figure?) and when you looked down the hill at the city is was pretty much black. It wasn't too long after that when the police came along in their cruiser and announced over the PA that it was a mandatory evacuation of the neighborhood. We had a quick freak-out, but our stuff was ready to go so we threw it in our cars and boogied! It's odd to leave your place wondering if anything will be there when you return. Our great friends, Chris and Kenny, at the Presidio Motel set us up right away with a place to stay. Ironically, the motel is only about a minute and a half down the hill from our house yet it was in a safe zone. We stayed there for two nights and returned home today. Unfortunately, the so-called "Tea Fire" claimed about 110 homes and 1,800 acres during that time. We were part of the lucky bunch, we had a house to come home to. Here's a shot from our front porch, I it took about half an hour before evacuation. I really don't have much going on in the way of "creative" shoot'n these days. I am still really looking forward to my upcoming trip to El Mirage to shoot some dry lake bed racing. Until then, I am just snapping a few fun pics here and there. 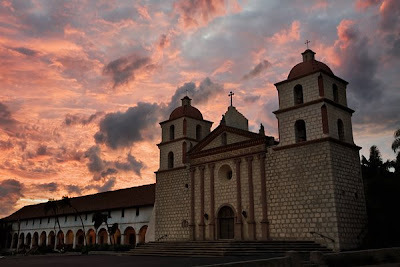 I live about a block from the Santa Barbara Mission and over the last two years it has become an easy target for me. 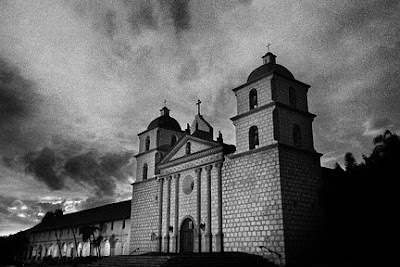 On Halloween I looked out the window and noticed some nice clouds forming so I grabbed my camera and headed over to the Mission. Here is what I got. Keep your eye out for more of these. While I'm in a sort-of funk and deciding on what my next creative move is, I'll probably be doing more of these to keep the trigger finger from getting rusty.